Exploding Head Syndrome is a snapping into consciousness, a synaptic charge of analog dissonance saturated through a complex undercurrent of pulsing minimalism, profound in its simplicity. A static haze of electronic distortion drifts in and out of lucidity to a sure propulsion of stone age repetition and heady bass vibrations, the momentum held on a thread of acoustic tension. As warm organs drone around the oscillating bones of enchanted melodies, an electric hive of enclosing guitars encircle Lawrie’s trance induced visions, which hang suspended, fractured at the core, until completely enveloped by the gathering swarm. 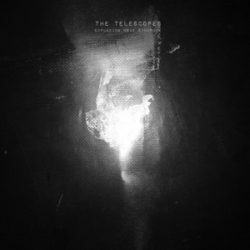 Welcome to the 11th studio album from The Telescopes, their third for Tapete. Consisting of eight new songs and incantations that form a series of sonic convulsions stretching the parameters of intuitive composition to the point of auditory illusion. Conceived in 1987, The Telescopes emerged as innovators in the field of melodic noise, becoming a crucial inspiration to a multitude of artists and listeners alike. The group has consisted of a revolving line-up centered around lead protagonist and founding instigator Stephen Lawrie. With the exception of “Until The End”, Exploding Head Syndrome was created entirely by Lawrie himself while immersed in solitude deep in West Yorkshire. As the title suggests, this is the sound of a triggered mind reaching into the depths of his own inner turmoil on a personal quest for basic clarity. Whereas previous albums for Tapete have set a parallel course between song-based structures and freeform impressionism, Exploding Head Syndrome employs almost traditional song writing techniques to achieve a melodic swirl of simplistic refrains capable of lulling the listener into vast sonic dimensions. In the 1700s, William Herschel defined a telescope as an instrument through which a person may view “beyond the realm of natural vision”. This is the mantra of The Telescopes. “Until The End” was co-written with Chris Plavidal (Stumptone) and is dedicated to the late Nevada Hill (Bludded Head). Exploding Head Syndrome is the name given by John M. S. Pearce in 1989 to a phenomena described by Robert Armstrong-Jones in 1920 as “snapping of the brain”. It is a condition in which a person experiences unreal noises. The front sleeve holds an image of a blank sheet blowing in a breeze. A natural light phenomena occurring at the time the photograph was taken gives the illusion of a face.